There are so many yogis that inspire me in my practice and in my life. Today I want to introduce you to one of them. 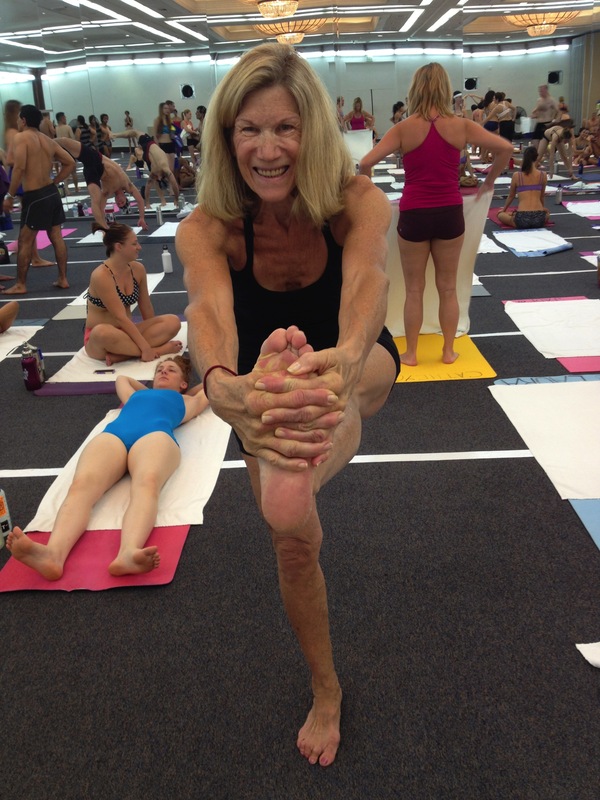 Sandra, who will turn 71 years old on New Year’s Day, has been practicing Bikram Yoga since 2008 and attended teacher training in 2012 at 68 years old! I have had the pleasure of practicing alongside Sandra as well as taking her classes. Sandra inspires me with her calm presence in the hot room, and her beautiful and peaceful practice. Nothing can shake her! She is a warm and encouraging teacher, but also challenges us to do better each day. PLUS, she is 70 years old! Sandra inspires me to continue with my practice in the hopes that my future 70-year-old self can match her example. Sandra at teacher training in 2012. HOTM: How did you discover Bikram Yoga? Sandra: I knew about Bikram Yoga from my son who has been practicing since the mid 1990s. I personally discovered Bikram on May 21, 2008, when I walked into Bikram Yoga NYC’s Upper East Side studio. My first class was difficult. I had trouble adjusting to the heat. I stood for 20 minutes and was on the floor for the rest of class. I left wondering what was I thinking, but I went back the next day and never looked back. HOTM: How often do you practice? Sandra: I try to practice every day. I prefer practicing first thing in the morning. It gives me the energy to carry me through the entire day and accomplish everything I need to do each day. My first class was at 6 am and I have kept up that pattern. HOTM: What does your practice mean to you? Sandra: I truly believe this practice is a gift for good health. I fortunately do not have any physical issues like knee or hip pain. The yoga makes me feel good overall. I feel energized and strong. I am balanced, both physically and mentally. The word “stress” has left my vocabulary. I am very much at peace and I can handle issues that come up thoughtfully and calmly. I think much clearer and see solutions easier. HOTM: What do you enjoy most about your practice? Sandra: I enjoy the energy you get from the other students during your practice. That energy can get me through any tough class. My favorite series is the balancing series. As I get older, I know how important it is to be balanced physically, and it truly helps me to stay sure-footed. HOTM: What made you decide to become a Bikram Yoga Teacher? Sandra: After practicing for two years, I wanted to share the passion I have for this yoga with everyone, and I felt being a teacher was the way to do it. I remember hesitating, not feeling confident I could remember the dialogue at my age, but I kept tossing the idea around and finally I had the courage. I feel that I have accomplished, as a teacher, what I went to training to do. I truly believe the students in my class have a great practice and come out feeling good. That is all I wanted for them – to feel the passion that this practice can give. HOTM: How did you like teacher training? Did you feel your age set you apart? Sandra: It was an amazing experience. You return a different person. I attended teacher training in Fall 2012 in Los Angeles. It is a nine week commitment. I studied the dialogue the summer before, so I went there knowing the standing series. People were friendly. We felt bonded that we were all there together pursuing our passion. We practiced twice a day and had lectures and dialogue clinics. There were late nights, until 3 or 4 am, sometimes. It was challenging, but it taught me discipline. My age was an inspiration to many. There were 443 of us, the largest group ever. I became the shoulder to lean on during the emotional breakdowns and a confidante to many. HOTM: What tips do you have for students in your classes? Sandra: New students should not fear the heat, which is always the biggest issue. Everyone is a beginner. It is not like a gym where you may feel intimidated. Bikram is for everyone – tall, short, big, small, young or old. Regular students should try not to become robotic. They know the practice, so they stop listening to the dialogue. The dialogue is the key to the practice. If you listen to the words and do what you hear, you will go further into your postures. HOTM: Do you have any tips for practicing later in life? Sandra: It is so important to stay healthy. Aging is not the time to say, “I probably will have a stiff knee, or pain in my back because I am getting older.” It is not true! There is no need to give in to age. Take hold of your body and keep it strong. You are the age in your head, not what your birth certificate says. I know there is an 18-year-old inside me and she is not ready to give up! HOTM: What are your future plans? Sandra: This has been quite a journey, beginning a new career at 68! I was a stay-at-home-mom, went into finance, owned my own business and retired at 60. Totally bored, I got my real estate license. But walking into that Bikram studio, I knew there was something else out there for me. I had tried different types of yoga but the consistency of this practice – that it doesn’t change daily like other styles – convinced me that this was the one for me. In the future, I plan to travel around the country and world and visit my fellow teachers from training. I plan to take their classes, and hopefully teach a class at their studios. I will continue to practice every day. I am so thankful to all who have entered my life and made it so special.